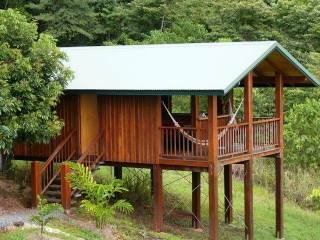 Coral Sea Views consist of two identical solid timber chalets set high up in the rainforest, with incredible views of Thornton Peak (Queensland 3rd highest peak) and the beautiful Coral Sea. Each chalet has a bedroom with a queen size bed and an ensuite, an open plan lounge with a double size sofa bed, which leads onto a balcony with two hammocks. The chalets also have 150 litre fridge, a small bistro setting, and a couple of bar stools. Tea/coffee making facilities. shampoo and conditioner, soap and all bed linen and towels provided as well as an Ipod docking station & radio. In the breakfast area there is a barbecue with a wok burner and all pots pans crockery utensils etc that guests are welcome to use. 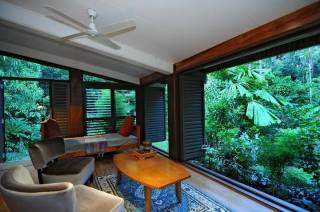 It overlooks the swimming pool and lovely tropical gardens. 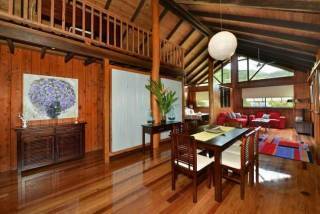 Coral Sea Views Chalets are private and secluded and located away from the hustle & bustle of tourists yet convenient to eating outlets and magnificent beaches and activities. Please leave the place how you found it! Booking is confirmed on receipt of payment, or credit card details which are held for security. 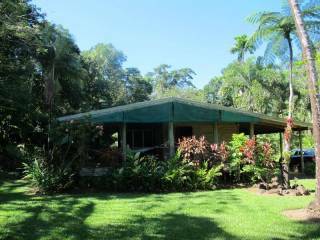 Coral Sea Views is 2.5 hours from Cairns and 1.5 hours from Port Douglas. 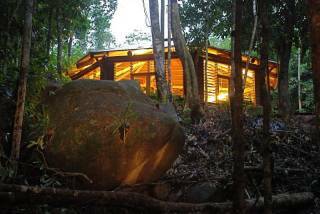 Head north along the scenic Captain Cook Highway, drive through the township of Mossman, and 25kms north is a turn off to the right signposted Daintree River and Cape Tribulation. Turn right here and this will take you to the ferry to cross the Daintree River (operates 7 days a week, 6am to midnight and costs $25.00 return per car). Drive off the ferry and travel a further 15kms. You will cross a bridge over Hutchinson Creek, we are the next street on the left - Mahogany Road. Drive nearly to the top and you will see the Coral Sea Views sign on the right hand side.